V. is Wooden Shjips first new album in five years and it finds the bands’ trademark space rock newly spiked with a heavy dose of warm summer sunshine. Equal parts laid back groove and anxious tension, it delivers the perfect soundtrack for either a summer drive with the top down and your face bathed in sunlight or conversely coming down from a pretty good drug high, alone in your room at 3am and staring at the walls. Somehow this perfect gem of an album works for both scenarios. Opening track “Eclipse” kicks the album off in fine style that finds the bands’ Hawkwind meets The Velvet Underground sound captured to full effect. Spacey guitars and synths, both heavy with delay and effects, weave in and out of the mix, while thunderous bottom end, cranked out by the bass and drums holds everything together like Super Glue. “Staring At the Sun” the lead single from the record clocks in at over seven minutes. Now you just have to love a band that releases a seven-minute slab of space-rock calling on influences as diverse as the California psych soul of the Buffalo Springfield and the Teutonic robot rock of krautrockers Neu; and then wraps them all up into a gauzy piece of ear candy suitable to melt brains and open minds everywhere. Speaking of brain melting…for those of you inclined this is most definitely a record that is going to WOW when listened to with headphones. The mix by Cooper Crain literally bubbles and floats between speakers while never losing its focus. The fat bottom end laid down by rhythm section of Omar Ahsanuddin and Dusty Jermier is rock solid and leaves plenty of room for the synths, guitars and vocals of Nash Whalen and Ripley Johnson to wander on and off center stage for their turn in the spotlight. 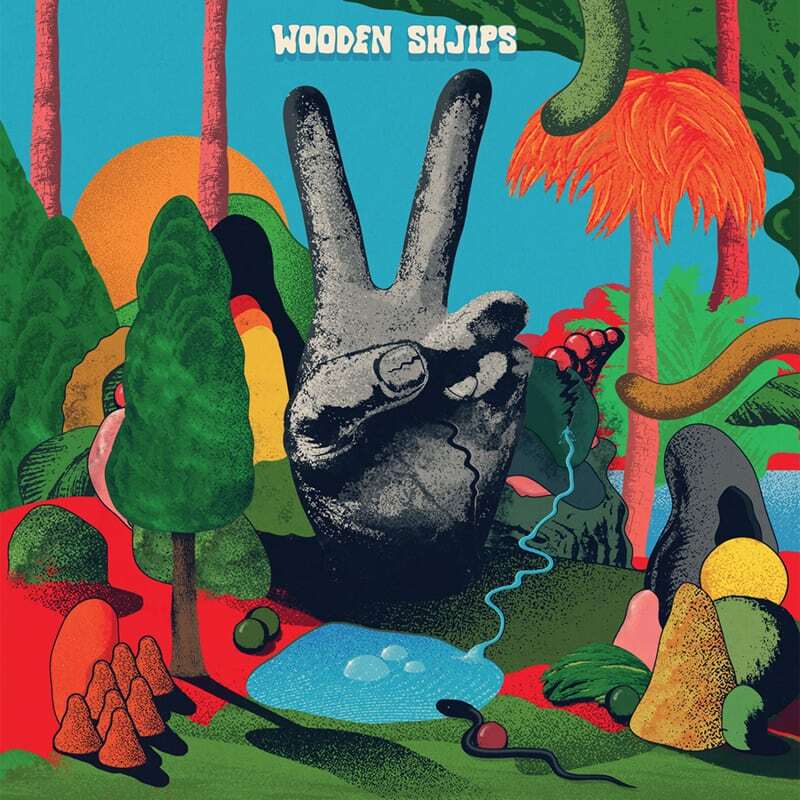 With V. (the “V” can also be interpreted as a graphic symbol of a peace sign – surely a comment on the current political and global tensions effecting the world) Wooden Shjips have delivered up all you can ask for from a band back in action after a five-year hiatus. It’s full of everything that fans loved about the band – but now informed with a new artistic growth earned by a half decade of new experiences and sounds infusing the music. V. is a sure pick as your soundtrack to the hazy crazy summer of 2018, enjoy it.